Plant emissions represent one way of assessing the environmental impact of a combustion power plant. Another way of looking at the impact is to assess the total amount of energy a plant uses to produce each unit of electricity it generates. When the results of such assessments - called life-cycle assessments because they look over the complete lifetime of the plant - for fossil-fuel- and biomass-fired power plants are compared, the results are unexpected. A basic life-cycle assessment will consider all the coal or gas burnt by a fossil fuel power plant as energy consumed. However it will not consider biomass burnt in a biomass plant as energy consumed because over the lifetime of the plant all the biomass is assumed to be replaced. Such as assessment, not unexpectedly, shows a biomass plant using up to 100 times less energy to generate a kilowatt-hour of electricity3 than a coal- or gas-fired plant. 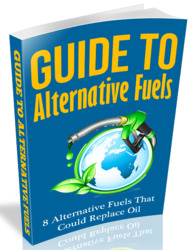 A more realistic comparison is obtained when the fuel consumed by the fossil fuel power plant is excluded too. 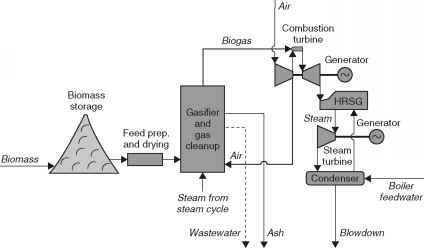 Typical figures for such an assessment show a direct-fired biomass power plant consuming 125 kJ to generate each kilowatt-hour, a biomass gasification power plant utilising an energy crop using 231 kJ/kWh, a coal-fired power plant using 702 kJ/kWh and a gas-fired power plant using 1718 kJ/kWh.4 So even under these conditions the biomass power plant produces more electricity for each unit of energy it uses that the fossil-fuel-fired plant. The reason for this is to be found in to cost of mining and transporting the fossil fuel. This is a more energy-intensive process than harvesting and transporting biofuel. The gas plant performance is also degraded by gas losses during transportation. But the results indicate that purely on an energy basis the biomass power plants are more efficient than fossil fuel plants.